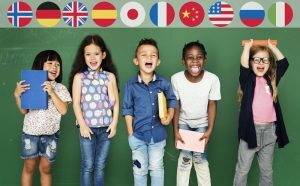 There are an increasing number of children who are growing up speaking or understanding two or more languages, one at school and among friends and another at home. At Little Acorns some two thirds of pupils, who are aged 2-6, are bilingual and the majority of these children are learning English as a third language. Learning other languages at an early age is a great opportunity as research now shows that bilingualism boosts cognitive development . The brain becomes more flexible when switching between languages and this flexibility of thinking can play a key role in all types of learning. Home (or first) languages are a key factor in the development of additional languages, particularly when the language (s) spoken at home is different to that spoken at school or with friends. Moreover, research shows that using home languages alongside new language acquisition will make the process of learning a new language faster and easier. So here are five ways to help develop your child’s home language. In order to become bilingual, your child needs to be exposed to your home language and have an opportunity to use it. Use routine daily events, such as meals, bed and bath-time, or going to the park, to increase your child’s vocabulary in your home language. This becomes increasingly important as your child moves up through school and begins spending more time using their newly acquired language. When parents have different home languages, it is preferable that each parent uses their first language and that this is used with consistency. This is how children learn languages simultaneously. Distinguishing between two languages is easier for a child when there are clear divisions between the two languages. Of course, sometimes this happens naturally (e.g. speaking one language with mum and another with dad) and, in other cases, it depends on context. For example, my own children spoke only English at home but French at school. But all families are different and what might work for one family, might not work for another. When learning an additional language some children can find this initially unsettling. At Little Acorns, children have sometimes gone through a number of sequential stages. First, they naturally continue to try using their home language. Then a silent period can follow, where they are absorbing both the patterns and sounds of the new language. Next, children will begin to use words or phrases they have heard regularly (e.g. ‘water please’, ‘snack-time’) and eventually, children begin to use their newly acquired language with more words and short sentences (e.g. “Janet, please can I toilet”). Little Acorns believes that what is learned in one language is easily transferred to another. As such, pupils can express knowledge in their home language (e.g. to say the name of an object or describe something) and then they are given the new English word or translation. This allows all children to be included and to feel valued, which contributes to more active learning. Sharing books in your child’s home language will enable them to learn more vocabulary, as well as recognise the patterns, sounds and shapes of words of your home language. It is particularly important to do this if you are your child’s only means to your home language. Many classic children’s books have now been translated into other languages and some are now available in bilingual versions (e.g. ‘Going on a Bear Hunt’, ‘Farmer Duck’). Language Lizard is a supplier of bilingual children’s books available in over 50 languages : www.languagelizard.com. Once your child is speaking well in your home language, you could extend this by helping them to use language for more abstract thinking (e.g. by solving jigsaw puzzles together, playing word games or telling stories). At Little Acorns, children do this by creating ‘stories’ with a deck of picture cards (e.g. a castle, a princess, treasure). Each child randomly chooses a card and takes turns to add their line to the evolving story. The children also use specific ‘story language’ such as ‘Once upon a time’ and ‘The End’. Once each child has had a turn, the teacher then retells the story. This not only values the children’s contribution but boosts self-esteem as well. The children are always delighted to hear their story retold. Sometimes the above is extended further by asking the children to retell the events of their story in the order in which they happened, using vocabulary such as ‘in the beginning’, ‘middle’ and ‘end’. Being able to sequence events in a text is a key comprehension strategy and something you could try at home with your child. Remember, the main purpose of language is communication and language is developed through interaction and engagement. Make it fun! Some parents are not comfortable talking to their child in their home language when they are out in town, especially if their partner does not share their language. If you are worried about excluding others, then try repeating and paraphrasing what you say in the other language. 5. Celebrate your language and culture! First and foremost, celebrating your language and culture with your child enables them to stay connected with other family members (e.g. perhaps grandparents abroad) and remain grounded in their own culture whilst adapting to a new one. Traditional celebrations are at the very heart of any culture. 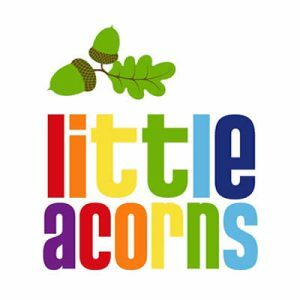 Little Acorns takes great pride in celebrating its families’ diversity, both with pupils and the parents themselves. It provides an opportunity to find out more about what we have in common rather than what makes us different. When shared with others, cultural celebrations can foster respect and open-mindedness for other cultures. I witnessed how a child, who was previously shy about sharing one of his two home languages (Mandarin), suddenly become very proud of his mother, his language and his culture when an opportunity was given in class to celebrate Chinese New Year. 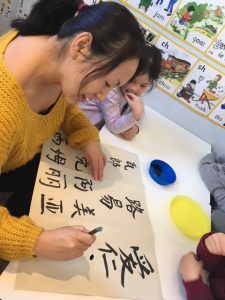 The mother wrote the children’s names in calligraphy, explained the Chinese Zodiac and traditions and shared Chinese pears and fortune cookies for snack-time, much to the delight of the other children. When the mother left, the little boy beamed and said, “Je suis si fière de ma maman!” (“I am so proud of my mummy!”) In the following class, the same little boy asked if he could count the children in Mandarin, rather than English, which he had been reticent to do previously. Similarly, Little Acorns has celebrated the Persian New Year, as well as shared other language versions (e.g. 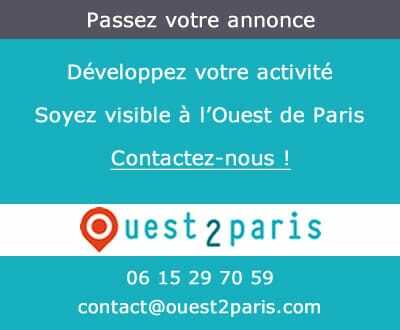 French, Farsi and Russian), of stories and folktales with the children. The children have observed and compared the different printed characters and also noticed how some books are read from back to front. Why not ask your child’s school if there is an opportunity to celebrate your culture in a meaningful way? If this is not possible, then perhaps think about holding a small celebration at home and invite some of your children’s friends to share? Lastly, it is not only children who can learn respect for other cultures. Little Acorns has organised class dinners for its parents at Chinese, Italian and Persian restaurants, where the relevant families take charge of ordering the food for everyone and take pride in explaining and sharing their cultural traditions. Little Acorns believes that if children and their families feel valued and welcomed, they are more likely to participate actively in learning. (This article is based on an article by Penny Tassoni MBE, written for Nursery World magazine. Penny Tassoni is an education consultant, author, keynote speaker and trainer who specialises in the whole spectrum of learning and play).